WASHINGTON — When President Trump fired Secretary of State Rex Tillerson a month ago (it seems much longer than that, right? ), he and his team probably didn’t think they’d have to work this hard to confirm Tillerson’s replacement Mike Pompeo. They’ve put out the word that Pompeo met with North Korea’s Kim Jong-Un, ostensibly to help with the confirmation fight; they’ve tried to twist Rand Paul’s arm from being “no” to “yes”; and they’re putting pressure on Democrats, especially those from red states, to support Pompeo. All of this over someone who ALREADY won Senate confirmation a year ago to be CIA director. And the difficulty to confirm Pompeo raises this question: Can Trump afford to fire any other cabinet members or appointees who need Senate confirmation in the current 51-49 U.S. Senate? If you’re EPA Administrator Scott Pruitt or HUD Secretary Ben Carson, you’re probably breathing a sigh of relief about your job when observing just how hard it has been for Trump to replace Rex Tillerson. And the upcoming confirmations for Gina Haspel (CIA) and even Ronny Jackson (VA) won’t be easy, either. NBC’s Frank Thorp reports that the Senate Foreign Relations Committee has scheduled its committee vote on Pompeo forMonday at 5:00 pm ET. While Team Trump has had roll up its sleeves to get Pompeo confirmed, red-state Democrats facing re-election this year — Sens. 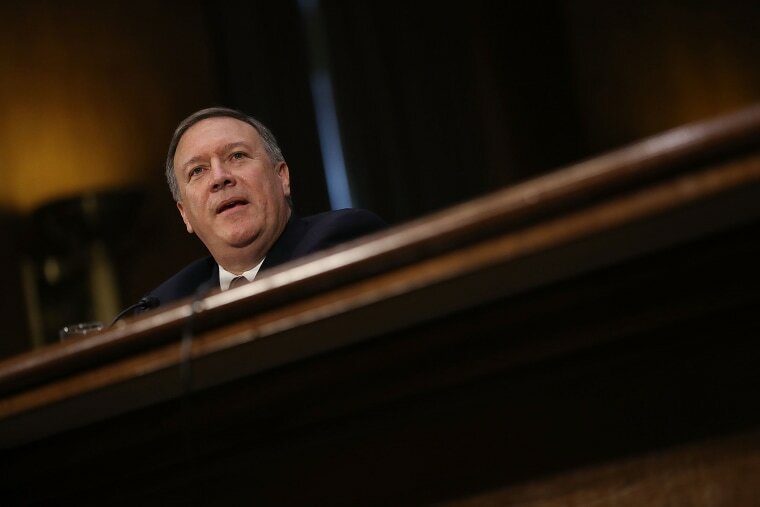 Claire McCaskill, Heidi Heitkamp, Joe Manchin, Joe Donnelly — face a dilemma on Pompeo. Do they vote FOR his vote confirmation, risking alienating base Democrats they’ll need even in these red states? Or do they vote AGAINST him, and risk seeming like a partisan engaging in obstruction when they’re trying to tout their bipartisan credentials? Trump Claim #1: "[T]here was no collusion, and that's been so found, as you know, by the House Intelligence Committee. There's no collusion. There was no collusion with Russia, other than by the Democrats — or, as I call them, the ‘obstructionists,’ because they truly are obstructionists." The Facts: While Republicans on the House Intelligence Committee have said there was no collusion between Russia and Trump's 2016 campaign, Democrats on the committee don't agree. And neither do Republicans on the Senate Intelligence Committee. "The issue of collusion is still open, that we continue to investigate both intelligence and witnesses, and that we're not in a position where we will come to any type of temporary finding on that until we've completed the process," Senate Intelligence Committee Chair Richard Burr, R-N.C, said back in October 2017. In addition, Democrats and Republicans agree that the original Russia probe was triggered by the revelation that Trump campaign adviser George Papadopoulos told a foreign diplomat that Russia had dirt on Hillary Clinton. Trump Claim #2: “This is a hoax,” Trump said of the Russia probe and the Mueller investigation. While it there is no proof directly linking Trump to Russia’s interference in the 2016 election, this is quite a rap sheet of indictments and guilty pleas. and most recently, decided NOT to impose sanctions on Russia for the recent chemical attack in Syria (“We'll do sanctions as soon as they very much deserve it, we will have -- that is a question,” he said at yesterday’s news conference). By the way, if the Russia investigation was a hoax and there was nothing to hide, would we be seeing articles like this? In case you missed them, here are some of the recent midterm developments that we’ve chronicled on our “Rundown” blog: Republican Rep. Todd Rokita, who’s running in the May 8 Indiana Senate primary, has been told by Trump’s re-election campaign to take down misleading signs making it seem the president endorsed him… The DCCCmisfired on a press release listing TX-7 candidate Lizzie Fletcher on its “red to blue” program and then corrected it, omitting Fletcher’s name… Outgoing Sen. Bob Corker praised the Democrat – Phil Bredesen – running to replace him… NBC’s Renee Hickman writes up the new polling project Democratic groups unveiled on Wednesday… And a Quinnipiac poll showed Sen. Ted Cruz leading Beto O’Rourke by just three points in Texas.